The American Association of Colleges of Nursing (AACN) has prepared a draft position paper calling for the Bachelor of Science in Nursing (BSN) degree to be the goal as the minimum preparation required for licensure as a registered nurse. This is a goal we strongly support. Nursing is the only health profession that has multiple entry paths to entry-level licensure and practice. Currently, students can sit for the RN exam after taking a two-year course of study that leads to an associate degree. This degree is granted primarily by private nursing schools and community colleges. At a time in the past when nurses almost inevitably worked in hospitals and did routine tasks, this was sufficient preparation, just as a high school diploma was adequate preparation for the majority of jobs that were available 50 or 75 years ago. But nursing in 2018 is very different from what it was 50 or even just 15 years ago. Nurses today work in a far wider array of venues, from urban clinics to freestanding rural practices. They use a constantly-evolving combination of complex technologies to monitor and guide treatment of patients who often have multiple chronic conditions. Nurses are the final checkpoint when medications are administered, and the first line of detection when a patient is getting worse instead of better. Nurses today are not just bedside aides. They are patient advocates, public policy shapers, researchers, interpreters of scientific evidence, innovators and creators of new techniques, and legislative consultants. Healthcare consumes 18 percent of our gross domestic product, and nurses are increasingly being called upon to make healthcare policy and have input into legislative initiatives that seek to provide more healthcare equity while reducing costs. Today’s nurse must be ready to interact with a more diverse population—diverse in age, diverse in race, diverse in economic status. They must be prepared to understand public policy and how it is formed and implemented, based on a knowledge of the legislative process, economics, politics, and history. They must be advocates and educators, as well as caretakers. The goal of a BSN degree is to graduate a nurse who is capable and ready to engage confidently with a wide range of patients as well as policy makers and the general public. Being a contemporary nurse is about far more than simply having the mechanical skills to start an IV or take vital signs. The bachelor’s degree provides a combination of general education and nursing education that gives students all the skills they need. One study found that, “Hospitals with a higher percentage of RNs with baccalaureate or higher degrees had lower congestive heart failure mortality, decubitus ulcers, failure to rescue, and postoperative deep vein thrombosis or pulmonary embolism and shorter length of stay.” Numerous studies, dating back more than a decade, have shown that mortality is lower in hospitals with more BSN nurses. One recent study reported that there a 10 percent increase in the proportion of nurses with BSNs is associated with a seven percent decrease in patient mortality. These aren’t minor differences. These are literally life-and-death differences. Despite knowing this, the profession has continued to accept RNs who do not have a BSN. There are several complex, interlocking reasons. The first is a shortage of nurses in general. Estimates are that there will be a need for an overall increase of 15 percent in the number of nurses in the coming decade. The second is the reason for that shortage. Nursing schools are having trouble recruiting and retaining faculty because of the disparity between academic remuneration and that of competing entities such as hospitals, healthcare organizations, and even investment firms that seek analytical expertise in healthcare. And the third reason is that a substantial number of students cannot bear the cost burden of a four-year college education, so they opt for the shorter route to licensure. This is disproportionately true for the very students we most need to attract—those from diverse backgrounds and underserved populations. The UW School of Nursing has a long tradition of exceptional education. Its thousands of graduates from not only the Seattle but also the Bothell and Tacoma campuses have immeasurably strengthened health care in this state. All three campuses offer BSN and MSN programs, and the Seattle campus offers Doctor of Nursing Practice and PhD programs as well. We graduate more than 500 nurses annually from our combined programs, and fully support the move to a BSN as the minimum degree attainment for RN licensure. 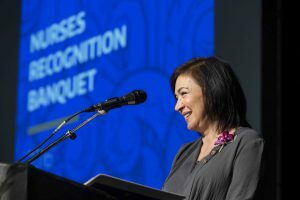 These degrees are the key to educating nurses who will provide primary care in rural and other underserved areas, practicing independently, or who will do the real-world research needed to help improve healthcare and healthcare access while reducing costs.